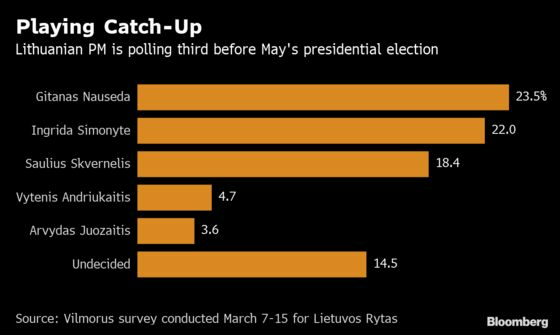 That’s thanks to Prime Minister Saulius Skvernelis, who’s trying to make up ground in the race for the Baltic nation’s presidency. He’s highlighting what he calls missteps back in 2008 by rival candidates -- the top two being a respected economist and an ex-finance minister. The tactics are rekindling debates about the aftermath of the huge spending cuts, which prompted hundreds of thousands to seek work elsewhere. But he’s gone further. 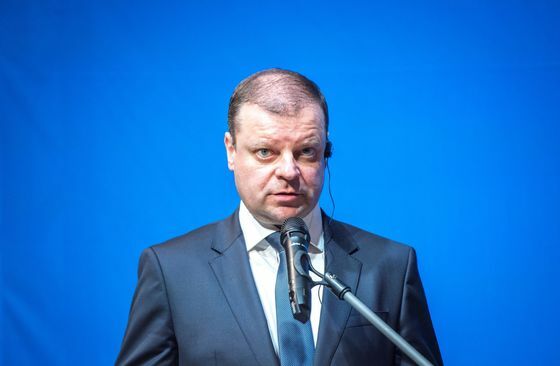 Skvernelis’s government this week instructed prosecutors to probe the actions of regulators and the central bank, while hinting there could even be compensation for some borrowers. “I highly doubt the prime minister would risk the reputation of the central bank and the country’s international reputation if he weren’t running in the election,” said Tomas Janeliunas, a professor at Vilnius University who sees the move as purely political. “This is an attempt to remind people about the crisis, to stir negative memories and to point the finger” at his competitors. The presidential front-runners are so far batting away the criticism. Former SEB Bankas AB economist Gitanas Nauseda still leads opinion polls before next month’s vote, despite Skvernelis reminding the public of his 2008 tip to invest in property. Real estate prices subsequently plunged by a third and remain below pre-crisis levels. Former Finance Minister Ingrida Simonyte, in second place, was combative when Skvernelis said she should have taken an international bailout rather than borrowing on debt markets at interest rates exceeding 7 percent. “Anyone can think they’d have performed miracles” if they’d been in power, she snapped back. The financial crisis is an especially sore subject in Lithuania, which suffered one of the world’s deepest recessions as state wages and pensions were slashed. While the European Union member of 2.8 million people, now also part of the euro area, was cited in Brussels as an austerity success, most workers who left haven’t returned. Skvernelis, a deputy police chief in 2008, is presenting himself as a defender of people who suffered under previous governments’ decisions. But his latest line of attack -- implying that regulators stood idle as commercial banks manipulated lending rates to push up costs for mortgage holders -- may draw a blank. Inquiries into this issue in the past found nothing unusual since rates typically spike during periods of financial stress. The central bank only became responsible for banking supervision in 2012. “We have nothing to hide,” central bank Governor Vitas Vasiliauskas said Monday.